GripClad's retro-fit overlay products are non-structural safety covers designed to be easily fitted over tread areas and/or the front edge of most types and styles of steps and stairs. We can cut to exact size that you require. Chemical resistant - in addition to being non slip, is also chemical resistant providing the perfect solution for potentially hazardous areas. Minimal downtime - our non-slip stair treads can be walked on immediately and fitted with ease keeping downtime to a minimum. Quick installation with immediate positive safety enhancement for all pedestrian traffic, and a very long term solution, which is virtually maintenance free. Slips, Trips and Falls are the most common cause of major injuries in workplaces including members of the public who also suffer the effects of inadequate controls on slip and trip hazards. Remove the slip risk - Remove the Liability ! 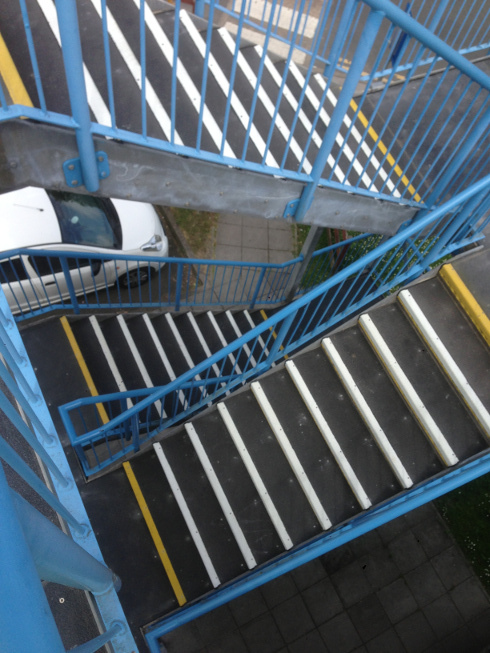 Fibreglass anti-slip stair tread covers and step nosing covers from GripClad provide a number of benefits. Tell us about your project and a friendly anti-slip expert will be in touch with your personalised, no obligation quote. Why Choose GripClad for Non-Slip Products? Because we know what we are talking about. We know what you are up against, and you may have probably cut corners on methods previously, and it didn't work out. 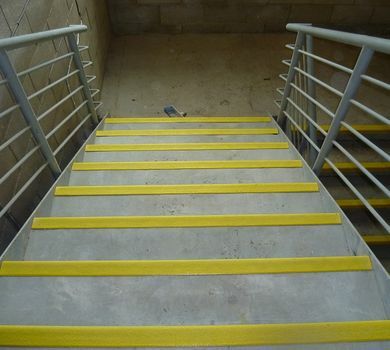 Our Anti-Slip Stair Products provide safety and security to stairs in all environments. You want a long term solution - you have it here, you want no worries - You have it here - You want Low Cost- You have it here - You want a long term solution - You have found us! We use isophthalic polyester in our non-slip stair nosings and treads. This resin provides good chemical properties used to seal the surface of the anti-slip substrate ensuring that the selected high-grade aluminium oxide aggregate cannot become detached from the GRP Sheet. This prevents wear out and provides a long lasting solution. Have a chat with us, we will sort it. Long lasting anti slip - our stair tread covers are produced using diamond hard high-grade grit, which is twice as hard wearing as the industry standard quartz. Chemical resistant - is also chemical resistant providing the perfect solution for potentially hazardous areas. As above but with a smaller profile. A product that aims to ensure that the edge of the step is highlighted for the visually impaired. "The product solved all our stair access problems because it offered a very durable grit surface in which student, staff and visitors could confidently walk on without fear of slipping or falling. We are very happy with the result."